I’m a little bit obsessed with the way that writers manage their time. As much as we love putting words on paper, it’s all too easy to let writing slip through the cracks of our busy lives. My problem (and maybe yours) isn’t lack of motivation. My issue is trying to do too many things in a day and then feeling stressed when I don’t finish my most important tasks. So I was thrilled to find TELL YOUR TIME. It’s a very short ebook, exactly the right size for the author to make her points without wasting my time (because I don’t have it to waste). Most people already plan their days, and most of us have stuffed them to overflowing with activities. Our time management fault is not lack of a schedule, but that we’re scheduling the wrong things. Andrews taught me to figure out my goals first, and then make sure I finish the activities that are compatible with those goals. This difference is crucial. TELL YOUR TIME is not a new scheduler or a program or a planner, but a new mindset. Instead of a schedule imposed from the outside, Andrews taught me to start from within. It’s head-slappingly obvious, but not something I’ve seen addressed in any other time-management book. A schedule that’s chosen rather than imposed is one I’m much more likely to keep. This doesn’t mean I do what I want, when I want. Sure, I could “schedule” myself to watch television and eat key lime pie all day, but that’s not compatible with my goals, so I won’t. I also won’t exclusively schedule work. Having fun is one of my goals, too, and TELL YOUR TIME encourages the reader to add fun to her days. Second, make a plan. Figure out your roles in life and the best ways to live in these roles. Ask yourself: what can I do now, this week, and this year to be my best self? This isn’t some airy advice that only applies to the self-employed. Even when working for someone else, on a fixed schedule, there are goals and choices to be made. And of course, there are all the other activities outside of work to plan for too. Doing this step, I had to really ask myself what was important to me. How did I want to live my life? Third, place your activities on a grid. This was a hard step for me, but very rewarding once done. Andrews has you divide a square into four quadrants–mandatory activity with fixed time (such as work), optional activity with fixed time (such as book club), mandatory activity with flexible time (such as laundry), optional activity with flexible time (such as going on Facebook). Every activity goes into one of these quadrants, since everything is one or the other. Once I filled my grid, it was simple. My priority activities were right there in their proper place. The final step is to take the activities off the grid and put them on a calendar. Remember, there are only 24 hours in a day. It seems obvious, but in our modern world, it is too easy to over-schedule ourselves. And there it is–a beautiful schedule that I am actually motivated to stick to. If I get off track, I need to set aside the calendar and take a good, hard look at my goals, then start my grid plotting again. Other books on this topic have left me feeling overwhelmed. 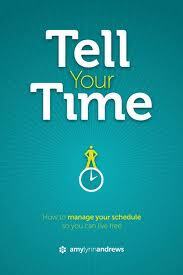 After Reading TELL YOUR TIME, I felt capable and empowered, all by changing the way I think about time management.